CLAY, Henry, (father of James Brown Clay), a Senator and a Representative from Kentucky; born in the district known as "the Slashes," Hanover County, Va., April 12, 1777; attended the Old Field School and St. Paul's School in Hanover County, Va.; studied law in Richmond, Va.; admitted to the bar in 1797 and commenced practice in Lexington, Ky.; member, State house of representatives 1803; elected as a Democratic Republican to the United States Senate to fill the vacancy caused by the resignation of John Adair and served from November 19, 1806, to March 3, 1807, despite being younger than the constitutional age limit of thirty years; member, State house of representatives 1808-1809, and served as speaker in 1809; again elected as a Democratic Republican to the United States Senate to fill the vacancy caused by the resignation of Buckner Thruston and served from January 4, 1810, to March 3, 1811; elected as a Democratic Republican to the Twelfth and Thirteenth Congresses and served from March 4, 1811, to January 19, 1814, when he resigned; Speaker of the House of Representatives (Twelfth and Thirteenth Congresses); appointed one of the commissioners to negotiate the treaty of peace with Great Britain in 1814; elected as a Democratic Republican to the Fourteenth Congress (March 4, 1815-March 3, 1817); seat declared vacant by the governor of Kentucky, "caused by the acceptance of Henry Clay to sign a commercial convention as minister plenipotentiary to Great Britain"; elected in a special election as a Democratic Republican to the Fourteenth Congress to fill his own vacancy on October 30, 1815; re-elected as a Democratic Republican to the Fifteenth and succeeding Congress (March 4, 1817-March 3, 1821); Speaker of the House of Representatives (Fourteenth, Fifteenth and Sixteenth Congresses); elected to the Eighteenth and Nineteenth Congresses and served from March 3, 1823, to March 6, 1825, when he resigned; again served as Speaker of the House of Representatives (Eighteenth Congress); appointed Secretary of State by President John Quincy Adams 1825-1829; elected as a National Republican to the United States Senate on November 10, 1831, to fill the vacancy in the term commencing March 4, 1831; reelected as a Whig in 1836 and served from November 10, 1831, until March 31, 1842, when he resigned; chairman, Committee on Foreign Relations (Twenty-third and Twenty-fourth Congresses), Committee on Finance (Twenty-seventh Congress); unsuccessful presidential candidate of the Democratic Republican Party in 1824, of the National Republican Party in 1832, and of the Whig Party in 1844; again elected to the United States Senate and served from March 4, 1849, until his death in Washington, D.C., June 29, 1852; lay in state in the Rotunda of the United States Capitol, July 1, 1852; funeral services were held in the Senate Chamber; interment in Lexington Cemetery, Lexington, KY.
Papers: 1804-1862. .4 cubic foot and 1 volume. Diaries and family letters and a portfolio of testimonials to Clay. Papers: In Hugh Anderson Haralson letterbook, 1849-1850. Papers: February 9, 1837. 1 letter. Papers: Correspondence in Peter Buell Porter papers, 1810-1925. Finding aid. Papers: Ca. 100 miscellaneous items in various collections. Papers: Discussed in Abraham Robinson Johnston papers, 1834-1849; and correspondence in Timothy Kirby papers, 1788-1935. Finding aid. Papers: 1 letter (September 23, 1826) in the Samuel Irving Rosenman papers. Finding aid. Papers: May 21, 1826; April 3, 1829; and November 16, 1833. 3 letters. Additional Papers: In Marie Joseph Paul Yves Rock Gilbert Du Motier, marquis de Lafayette collection, 1520-1849; and Massachusetts Militia papers, 1777-1852, account of ceremonies honoring Clay. Papers: 1802-1852 (bulk 1821-1852). 138 items. Correspondence and papers dealing with the second Bank of the United States, public finance, the Missouri compromise, the tariff, nullification, and the Whig party. Also a portrait. Finding aid. Papers: 1797-1855. Ca. 160 items. Miscellaneous personal, business, and congressional papers and correspondence, photographs, portraits, and memorabilia. Additional Papers: Correspondence and documents in Foote family papers, 1752-1987; Pope-Humphrey family papers, 1807-1938; Marshall family papers, 1815-1879; and others. Finding aid. Papers: In Thomas P. Cope diaries, 1800-1851, on 2 microfilm reels of originals at Haverford College; Eleuthere Irenee du Pont papers, 1771-1922 and 1782-1838; and Victor Marie du Pont papers, 1753-1847. Papers: 44 items in Clay-Sloane correspondence, 1822-1850; in Francis Pickens nullification papers; and in Edwin Francis Gay papers, 1917-1925. Papers: 1825-1829. Ca. 425 items. Letters written while secretary of state to ministers resident in the U.S. Finding aid. Papers: 13 personal letters (1839-1849) in the Bayard papers. Papers: Ca. 50 letters (1824-1833) in Josiah Stoddard Johnson papers, 1821-1839; in Richard Ashurst collection, 1704-1874; Richard Peters correspondence, 1821-1847; Condy Raguet official letters, 1824-1827; James Moore Swank papers, 1785-1898; Josiah Stoddard Johnston papers, 1821-1839; S.L. Fallon collection, 1684-1860; Biddle family papers, 1688-1883; Gilpin family papers, 1727-1872; Hopkinson family papers, 1735-1863; and James Buchanan papers, 1775-1868. Also discussed in Jonathan Roberts' memoir, 1799-1830, 2 volumes. Papers: 87 letters in various collections; handwritten transcripts of ca. 280 letters (1803-1849) made for William Henry Smith in the late nineteenth century; and correspondence in Benjamin Sebastian papers, 1795-1807. Finding aid. Papers: 1812-1849. 247 items. Also a collection of printed notices (1841-1859) of the Young Men's Henry Clay Association and Clay Festival Association. Papers: 1 letter (1832) in the Thomas C. Bright autograph collection discussing the election of 1832. Finding aid. Papers: 1802-1848. Ca. 40 items. Concern political, legal and business matters. Also a portrait. Finding aid. Papers: 1 letter (June 19, 1843) in Bookfellow Foundation autograph collection, 1705-1940. Papers: In Henry Clay family papers, 1732-1927. 75 containers. Political and family correspondence and papers relating chiefly to politics and all phases of his career. Available on 24 microfilm reels, which includes Clay items in other selected collections in the Library of Congress. Finding aid. Additional Papers: Correspondence in William Harris Crawford papers, 1810-1914; John Payne papers, 1780-1905; and Alexander Hamilton papers, 1708-1903. Papers: Ca. 200 items (1810-1852) in various collections. Finding aid. Papers: Mentioned in Caleb Goldsmith Forshey papers, 1838-1879. Finding aid. Papers: Memorial silk banner and ticket to oration (March 23, 1843) in honor of Clay. Papers: Correspondence in John Langdon papers, 1762-1972; and correspondence in United States Army Pay Department records, 1791-1870. Finding aid. Papers: 1800-1852. 450 items. Includes 56 letters from Rufus King and photographs. Additional Papers: Correspondence in Daniel Ullmann papers, 1826-1887 (bulk 1850-1856); Taylor family papers, 1799-1897; and Campbell-Mumford papers, 1719-1891. Papers: 7 letters (1817-1833) in the James Barbour collection. Official and personal correspondence. Finding aid. Papers: In Robert C. Wetmore papers, 1834-1899; Phelps and Gorham Company records, 1776-1892; Autographs of American authors and statesmen collection, ca. 1770-1865; Bradford Ripley Wood letter, March 3, 1848; F.G. Younglove letter, March 4, 1848; Peter Buell Porter letter, February 16, 1839; Millard Fillmore letter, August 16, 1844; and Alexander Hamilton papers, 1760-1830, on 46 microfilm reels of originals at Library of Congress. Papers: Correspondence in Walter Dun papers, 1802-1894. Papers: 24 items (1802-1849); and 16 letters (1823-1851) chiefly on political topics, and 1 broadside (October 26, 1824) of Pennsylvania electors supporting Clay for president in the Gilder Lehrman collection. Finding aid. Papers: In the Andre deCoppet collection, 1565-1942. Papers: 1823-1844. 5 letters. Also in John Peter Jackson correspondence, 1828-1860. Papers: Ms entitled "Sentiments embodied in H. Clay's speech in the Senate of the U.S. in 1839" in the Quintus Flaminius Atkins papers, 1785-1859. Papers: In George Catlin papers, 1821-1890, on 2 microfilm reels; and John Smith Preston family letters, 1836-1927, on 1 microfilm reel. Papers: 1793-1848. 1 cubic foot. Personal and business papers and correspondence, photographs, portraits, and memorabilia. Finding aid. Papers: March 31-April 6, 1826. 7 items. Correspondence relating to the Henry Clay - John Randolph of Roanoke duel. Use restricted to photocopies of the letters. Papers: 1801-1841. 70 letters. Also 230 Clay letters in various collections. Finding aid. Papers: 53 items (1811-1848) in several collections, including the Hughes, Cass, Goulburn, and Birney collections. Business and congressional papers and correspondence. Finding aids. Papers: Correspondence in Glenn O. Hardeman collection, 1777-1922. Finding aid. Papers: 1834-1844. 6 items (5 photoprints, 1 manuscript). Miscellaneous political correspondence. Additional Papers: 1 letter (1843) from Clay confidentially discussing political situation in Sergeant Smith Prentiss papers; and 11 letters in William Asbury Whitaker collection, 1597-1957. Papers: 16 letters by and 8 to Clay (1812-1851) in various collections. Finding aid. Papers: Ca. 250 items (1798-1852) in Clay and other papers, including James Breckenridge papers, 1783-1904 (bulk 1783 1830); and Quinby, Teakle, and Upshur family papers, 1759-1968 (bulk 1800-1898). Chiefly from his Senate service, many with political content. Finding aids to some collections. Papers: 29 items; and numerous items in various collections including the Graham family papers, 1798-1925, available on microfilm. Finding aid. Papers: In Johnston family papers, 1779-1891; and Patteson family papers, 1734-1906. Papers: Correspondence, 1810-1818 (3); comments about Clay in letters and journals, 1841-1949 (15); and in Green family papers, 1814-1971. Papers: 1 letter (1827) to Clay in the Moses Dawson correspondence, 1811-1845. Available on microfilm. Finding aid. Papers: Items in William Wirt papers, 1786-1850, microfilm of originals at the Maryland Historical Society; Daniel Webster papers, 1800-1895 (bulk 1824-1852), microfilm of originals at the Library of Congress; James Watson Webb papers, 1802-1967; Evarts family papers, 1753-1960; Ulrich Bonnell Phillips papers, 1712-1933 (bulk 1800-1861); Humphreys-Marvin-Olmstead collection, 1776-1867; David Daggett papers, 1781-1851; and others. Research Libraries Information Network In addition to the institutions listed above, items are also cataloged at: American Philosophical Society, Philadelphia, PA; Boyle County Public Library, Danville, KY; Brigham Young University, Provo, UT; Brown University, Providence, RI; Danville-Boyle County Historical Society, Danville, KY; Emory University Special Collections, Atlanta, GA; Kentucky Department for Libraries and Archives, Frankfort, KY; Louisiana State University, Baton Rouge, LA; Maryland Historical Society, Baltimore, MD; Pennsylvania Historical and Museum Commission, Harrisburg, PA; Rosenbach Museum and Library, Philadelphia, PA; State University of New York College, Oswego, NY; University of California, Bancroft Library, Berkeley, CA; University of Iowa Libraries, Iowa City, IA; University of Pennsylvania, Philadelphia, PA; and others. Alexander, Holmes Moss. The Famous Five. New York: Bookmailer, 1958. Baxter, Maurice G. Henry Clay and the American System. Lexington: University Press of Kentucky, 1995. ___. Henry Clay: The Lawyer. Lexington: University Press of Kentucky, 2000. Bearss, Sara B. "Henry Clay and the American Claims Against Portugal, 1850." Journal of the Early Republic 7 (Summer 1987): 167-80. Binkley, Robert W., Jr. "The American System; An Example of Nineteenth-Century Economic Thinking--Its Definition by Its Author, Henry Clay." Ph.D. dissertation, Columbia University, 1950. Blakey, George T. "Rendezvous with Republicanism: John Pope vs. Henry Clay in 1816." Indiana Magazine of History 62 (September 1966): 233-50. Brent, Robert A. "Between Calhoun and Webster: Clay in 1850." Southern Quarterly 8 (April 1970): 293-308. Brown, Thomas. "Henry Clay and the Politics of Consensus." In Politics and Statesmanship: Essays on the American Whig Party, pp. 117-53. New York: Columbia University Press, 1985. Clay, Henry. The Papers of Henry Clay, 1797-1852. Edited by James Hopkins, Mary Hargreaves, Robert Seager II, Melba Porter Hay et al. 11 vols. Lexington: University Press of Kentucky, 1959-1992. Clay, Thomas Hart. Henry Clay. Philadelphia: G.W. Jacobs Co., 1910. Ellis P. Oberholtzer completed the manuscript after Thomas Hart Clay's death in 1907. Colton, Calvin. The Last Seven Years of the Life of Henry Clay. New York: A.S. Barnes Co., 1856. ___. Life and Times of Henry Clay. 2 vols. 1846. Reprint, with new introduction by Michael Hudson. New York: Garland Publishing, 1974. ___, ed. The Private Correspondence of Henry Clay. 1855. Reprint. Freeport: Books for Libraries Press, 1971. ___, ed. The Speeches of Henry Clay. 2 vols. New York: A.S. Barnes Co., 1857. ___, ed. The Works of Henry Clay. 6 vols. New York: A.S. Barnes Burr, 1855-1857. Currie, David P., "Mr. Clay's Compromise," in The Constitution in Congress: Descent into the Maelstrom, 1829-1861, pp. 157-194. Chicago: University of Chicago Press, 2005. Eaton, Clement. 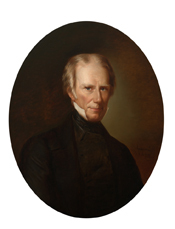 Henry Clay and the Art of American Politics. Boston: Little, Brown Co., 1957. Eichert, Magdalen. "A Consideration of the Interests Which Lay Behind the Attitudes of Benton, Clay, Webster, and Calhoun in the Development of Public Land Policy, 1830-1841." Ph.D. dissertation, New York University, 1950. ___. "Henry Clay's Policy of Distribution of the Proceeds from Public Land Sales." Register of the Kentucky Historical Society 52 (January 1954): 25-32. Follett, Mary Parker. "Henry Clay as Speaker of the United States House of Representatives." In Annual Report of the American Historical Association for the Year 1891, vol. 1, pp. 256-65. Washington: Government Printing Office, 1892. Foster, Thomas, and George Cochran. Eulogies Delivered in the Senate and House of Representatives of the United States on the Life and Character of Hon. John C. Calhoun, of South Carolina, Hon. Henry Clay, of Kentucky, and Hon. Daniel Webster, of Massachusetts. Washington: Foster Cochran, 1853. Gantz, Richard Alan. "Henry Clay and the Harvest of Bitter Fruit: The Struggle with John Tyler, 1841-1842." Ph.D. dissertation, Indiana University, 1986. Gerland, Jonathan Kirk. "Henry Clay and United States Indian Policy: An Assessment." Master's thesis, Stephen F. Austin State University, 1991. Harrington, J. Drew. "Henry Clay and the Classics." Filson Club History Quarterly 61 (April 1987): 234-46. Heidler, David S., and Jeanne T. Heidler. Henry Clay: The Essential American. New York: Random House, 2010. Hendricks, Rickey L. "Henry Clay and Jacksonian Indian Policy: A Political Anachronism." Filson Club History Quarterly 60 (April 1986): 218-38. Howe, Daniel Walker. "Henry Clay, Ideologue of the Center." In The Political Culture of the American Whigs, pp. 123-49. Chicago: University of Chicago Press, 1979. Jasinski, James. "The Forms and Limits of Prudence in Henry Clay's (1850) Defense of the Compromise Measures." Quarterly Journal of Speech 81 (November 1995): 454-78. Johnson, Gerald W. America's Silver Age: The Statecraft of Clay-Webster-Calhoun. New York: Harper Brothers, 1939. Jones, Thomas B. "Henry Clay and Continental Expansion, 1820-1844." Register of the Kentucky Historical Society 73 (July 1975): 241-62. Klein, Larry Dean. "Henry Clay, Nationalist." Ph.D. dissertation, University of Kentucky, 1977. Knupfer, Peter B. "Compromise and Statesmanship: Henry Clay's Union." In The Union As It Is: Constitutional Unionism and Sectional Compromise, 1787-1861, pp. 119-57. Chapel Hill: University of North Carolina Press, 1991. ___. "Henry Clay's Constitutional Unionism." Register of the Kentucky Historical Society 89 (Winter 1991): 32-60. Krueger, David W. "The Clay-Tyler Feud, 1841-1842." Filson Club History Quarterly 42 (April 1968): 162-77. Lightfoot, Alfred. "Henry Clay and the Missouri Question, 1819-1821." Missouri Historical Review 61 (January 1967): 143-65. Lindsey, David. Henry Clay-Andrew Jackson: Democracy and Enterprise. Cleveland: H. Allen, 1962. Maness, Lonnie Edward. "Henry Clay and the Problem of Slavery." Ph.D. dissertation, Memphis State University, 1980. Mathias, Frank F. "Henry Clay and His Kentucky Power Base." Register of the Kentucky Historical Society 78 (Spring 1980): 123-39. Mayo, Bernard. Henry Clay, Spokesman of the West. 1937. Reprint. Hamden, CT: Archon Books, 1966. McLaughlin, Jeremy M. "Henry Clay and the Supreme Court." Journal of Supreme Court History 34 (March 2009): 28-55. Morley, Margaret Ruth. "The Edge of Empire: Henry Clay's American System and the Formulation of American Foreign Policy, 1810-1833." Ph.D. dissertation, University of Wisconsin, 1972. Neely, Mark E., Jr. "American Nationalism in the Image of Henry Clay: Abraham Lincoln's Eulogy on Henry Clay in Context." Register of the Kentucky Historical Society 73 (January 1975): 31-60. Oates, Stephen B. "Harry of the West: Henry Clay." Timeline 8 (October-November 1991): 2-19. Peterson, Merrill D. The Great Triumvirate: Webster, Clay, and Calhoun. New York: Oxford University Press, 1987. Poage, George Rawlings. Henry Clay and the Whig Party. 1936. Reprint. Gloucester, MA: P. Smith, 1965. Remini, Robert V. Henry Clay: Statesman for the Union. New York: W.W. Norton Co., 1991. Rogers, Joseph Morgan. The True Henry Clay. Philadelphia: J.B. Lippincott Co., 1904. Schmucker, Samuel M. The Life and Times of Henry Clay. Philadelphia: J.E. Potter Co., 1860. Schurz, Carl. Henry Clay. 2 vols. 1887. Reprint of 1899 ed., with new introduction by Glyndon G. Van Deusen. New York: Chelsea House, 1980. Originally published as Life of Henry Clay. Seager, Robert, II. "Henry Clay and the Politics of Compromise and Non-Compromise." Register of the Kentucky Historical Society 85 (Winter 1987): 1-28. Shankman, Kimberly Christner. Compromise and the Constitution: The Political Thought of Henry Clay. Lanham: Lexington Books, 1999. Shannon, Jasper B. "Henry Clay as a Political Leader." Ph.D. dissertation, University of Wisconsin, Madison, 1934. U.S. Congress. Obituary Addresses on the Occasion of the Death of the Hon. Henry Clay, a Senator of the United States from the State of Kentucky. 32d Cong., 1st sess., 1851-1852. Washington: R. Armstrong, 1852. Van Atta, John R. "'A Lawless Rabble': Henry Clay and the Cultural Politics of Squatters' rights, 1832-1841." Journal of the Early Republic 27 (Fall 2008): 337-378. Van Deburg, William L. "Henry Clay, the Right of Petition, and Slavery in the Nation's Capital." Register of the Kentucky Historical Society 68 (April 1970): 132-46. Van Deusen, Glyndon G. The Life of Henry Clay. 1937. Reprint. Westport, CT: Greenwood Press, 1979. Watson, Harry L. Andrew Jackson vs. Henry Clay: Democracy and Development in Antebellum America. Boston: Bedford, 1998. Winkler, James R. "Henry Clay: A Current Assessment." Register of the Kentucky Historical Society 70 (July 1972): 179-86. ___. "The Political Economy of Henry Clay." Ph.D. dissertation, Fordham University, 1969.